CAO is seeking better and more efficient delivery of eye health and vision care services for all Canadians. Incident reports help the association make evidence-based recommendations to government and other stakeholders on the importance of regular eye examinations and to understand the funding required to support comprehensive primary eye care in Canada. This infographic (click to enlarge) details the main findings of the nearly 3300 incident reports received to date. We encourage all members to complete an incident report when a patient presents with underlying eye or systemic disease that would have gone undiagnosed without a comprehensive eye exam. This form may also be used to identify cases where patient care was negatively impacted by sight testing, independent of a comprehensive eye examination or by the purchase of glasses or contact lenses via unregulated dispensing on the internet. CAO will report back to ODs on the findings and use the numbers in its presentations to government decision makers. 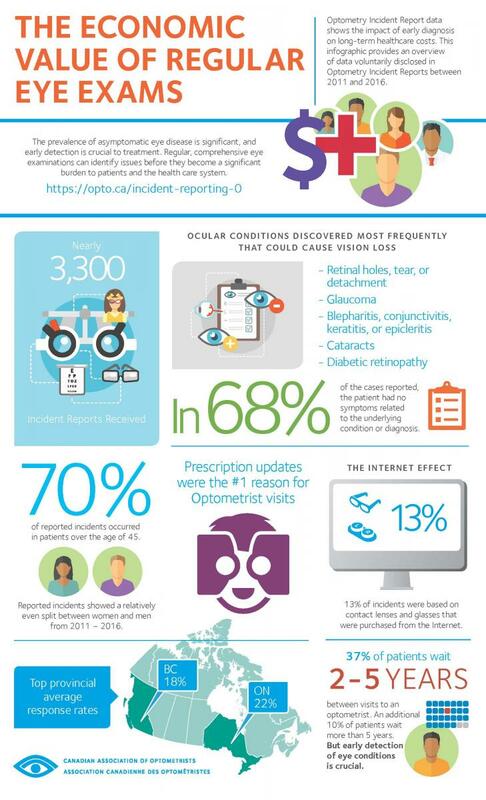 From October 2011 to June 2015, the Canadian Association of Optometrists (CAO) collected 2,983 Optometry Incident Report (OIR) forms from participating English and French speaking members.